InvoiceOcean is designed for convenience and speed. The most frequently used features are located in places very easy to spot. You will be receiving hints as you fill out the entries within various forms. Meanwhile, InvoiceOcean will be automatically calculating both the net and gross amounts for you. 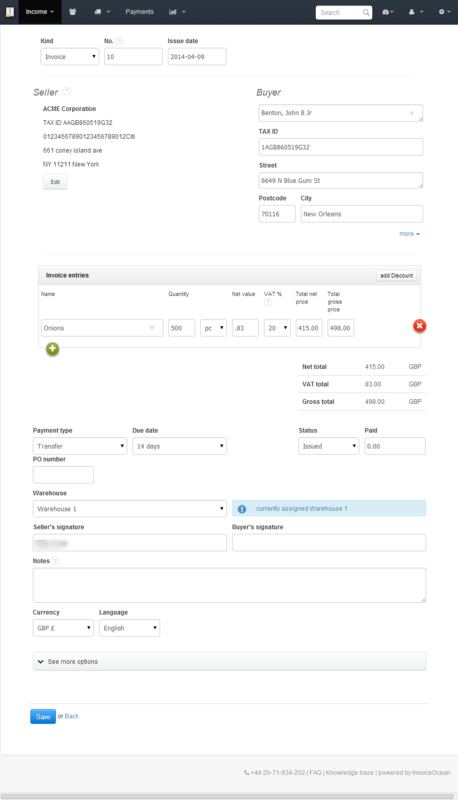 InvoiceOcean automatically puts dates, numbers and labels on all your invoices. Just enter your client's tax ID - InvoiceOcean will automatically fill in the remaining information. InvoiceOcean is pre-loaded with VAT rates - just pick an appropriate rate from the available list. Just a little information is more than enough for InvoiceOcean - our software autocompletes your invoice using the data you provide.